Posted text: "Martyr (Shahid) Omar Abu Laila (i.e., terrorist, murdered 2) from the town of Al-Zawiya, the one who carried out the Salfit operation. Omar Abu Laila (i.e., terrorist, murdered 2), 19, from the town of Al-Zawiya in western Salfit. 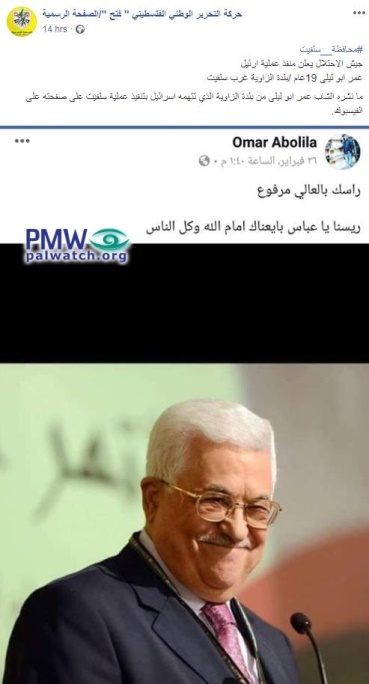 The post by terrorist Omar Abu Laila includes a picture of PA Chairman Mahmoud Abbas smiling. 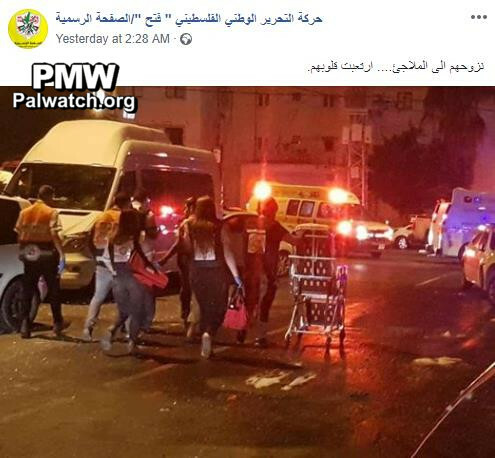 Pro-Hamas website: Palestinians in Gaza distribute sweets to celebrate terror attack in which 2 were killed; PA official allegedly calls attack "criminal"
Posted text: “When the occupation army soldiers do as they please on the Palestinian land and sow ruin and destruction in it, and when Israeli soldiers implement a policy of summary executions against the members of our people and execute three young Palestinians in one night, Israel must understand that the extent of the Palestinian response will be according to the extent of these attacks. Its leaders must understand that they are unable to defend even their soldiers (refers to Givat Assaf attack in which 2 Israeli soldiers were murdered –Ed.). They have attempted all of the criminal means to force our people to submit and wave a white flag, but all of their attempts have failed. Only one path remains for Israel that will ensure the wellbeing of its soldiers and settlers: full withdrawal by the occupation and its murderous settlers to the June 4, 1967 borders. 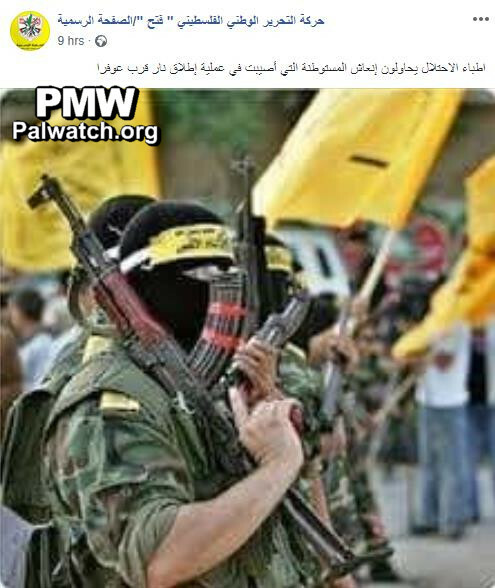 - Head of the Fatah Movement Mobilization and Organization Commission’s Information Office Munir Al-Jaghoub"
Givat Assaf shooting attack – a terrorist shot and murdered 2 Israelis and seriously wounded 2 others in a shooting attack next to Givat Assaf, near Ramallah, on Dec. 13, 2018. The terrorist fled the scene in a car driven by another terrorist. As of Dec. 13, 2018, they have not been apprehended. Following terror attack in which 2 were killed, Abbas' office condemns “unacceptable wave of violence” but blames it on Israel: "Our constant policy is the rejection of violence, invasions, and settler terror"
"In response to the events taking place in the West Bank (apparently referring to fatal terror attacks in Ofra and Givat Assaf and the killing of terrorists involved in the Ofra and Barkan attacks; see notes below –Ed. 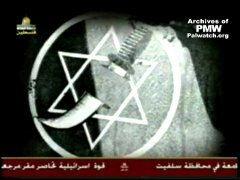 ), the [PA] Presidential Office said in a statement that the atmosphere that has been created by the policy of recurring invasions of the [Palestinian] cities, the incitement against His Honor [PA] President [Mahmoud Abbas], and the lack of a prospect of peace is what has led to this unacceptable wave of violence, which we condemn and reject, and the price of which the two sides are paying. The Presidential Office emphasized that our constant policy is the rejection of violence, invasions, and settler terror, [and] that it is necessary to stop the incitement and avoid creating an atmosphere that will contribute to tension. The Presidential Office emphasized that the president’s constant position is to end the occupation, establish the independent State of Palestine whose capital is East Jerusalem in the June 4, 1967, borders, and [honor] the decisions of the international institutions and international law – [all of] which will provide everyone with security, stability, and peace." The picture shows Israeli Military Advocate General Sharon Afek. 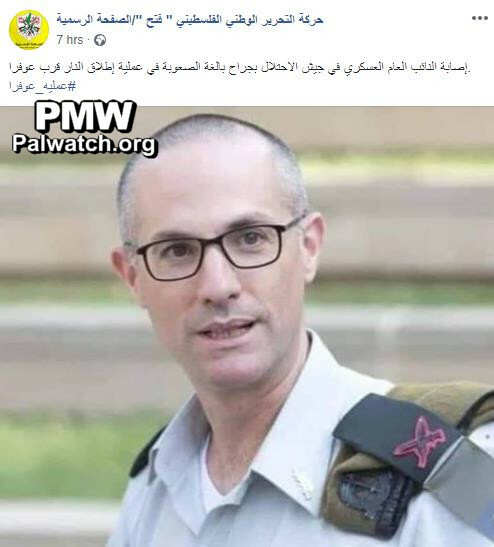 Posted text: "[Israeli] Military Advocate General of the occupation army [Sharon Afek] was severely wounded in the shooting operation (i.e., terror attack) next to Ofra (sic., there is no indication that Afek was present or wounded in the attack). Ofra shooting attack - Palestinian terrorists shot and wounded 7 Israelis - a pregnant woman, her husband, another man, and 4 teenagers - in a drive-by shooting attack next to Ofra, north of Jerusalem, on Dec. 9, 2018. The pregnant woman was severely wounded and doctors had to deliver her baby prematurely before operating on her. The baby died three days later. The terrorists fled the scene but were located three days later. 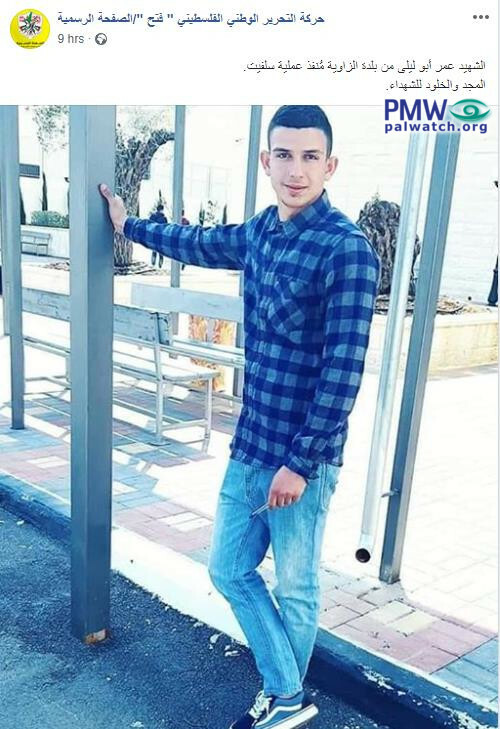 One terrorist, Saleh Omar Saleh Barghouti, was shot and killed by the Israeli army during the attempt to apprehend him, while other terrorists were taken into custody. The Izz A-Din Al-Qassam Brigades (Hamas' military wing) claimed responsibility for the attack. 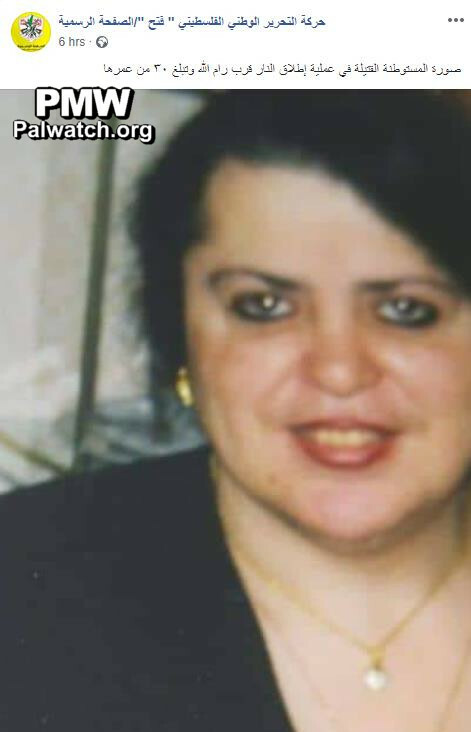 The picture shows a woman that the official Fatah Facebook page claims was murdered in the terror attack near Ofra on Dec. 9, 2018. At the time of the posting of the picture no one injured in the attack had died. The photo is apparently that of an Israeli woman in her 50ies who went missing a few days before the attack, according to Russian websites. 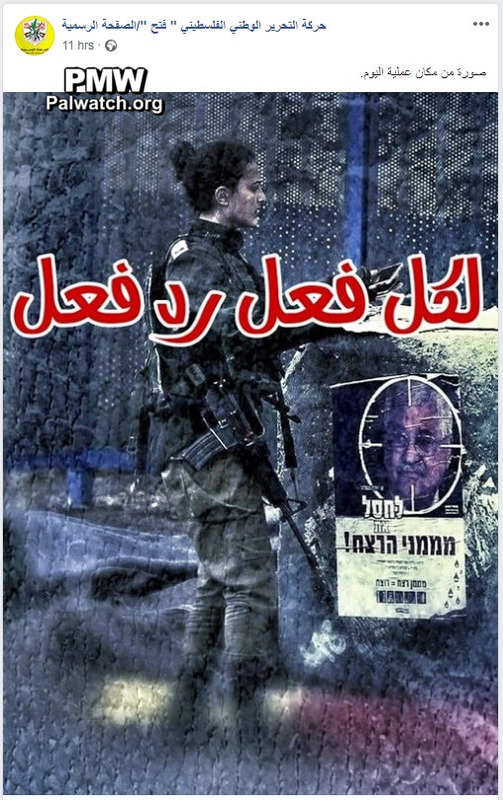 Posted text: "A picture of the 30-year-old female settler who was murdered (sic., severely wounded, photo apparently that of an Israeli woman in her 50ies who went missing a few days before the attack -Ed.) in the shooting operation (i.e., terror attack) next to Ramallah." 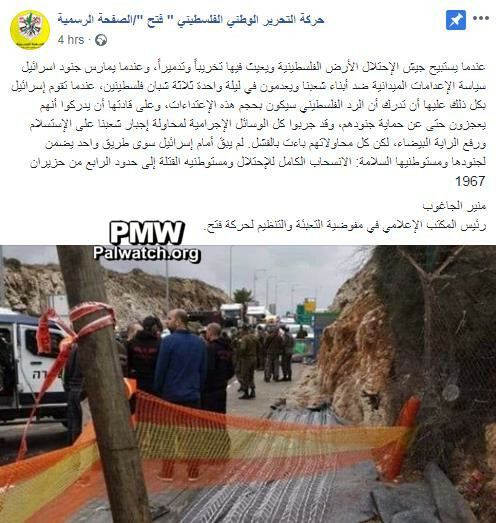 PA TV presents car ramming attack as a car accident, terrorist driver is a "Martyr"
Ramzi Adnan Abu Yabes – Palestinian terrorist who rammed his car into Israeli soldiers near Hebron on Nov. 26, 2018, wounding 3. Other soldiers shot and killed him at the scene. Israel-Hamas clash in November 2018 – an Israeli special forces unit entered the Gaza Strip on a secret mission on Nov. 11, 2018, and exchanged fire with Palestinian terrorists after being exposed. An Israeli lieutenant colonel and 7 terrorists – including Hamas Commander of Khan Yunis Nour Barakeh – were killed in the exchange. Following the incident Hamas fired hundreds of missiles at Israeli civilian targets, wounding a number of Israelis and killing a Palestinian worker in Ashkelon, and Israel bombed a number of terror targets in Gaza. A ceasefire was reached on Nov. 14, 2018. Posted text: "Going down to the shelters, their hearts filled with fear"
The picture shows Israeli ambulances and an emergency medical team in the street at night, apparently somewhere in Southern Israel while hundreds of missiles were being fired at Israel from the Gaza Strip on Nov. 12 and 13, 2018.